I am not all-carolled-out yet. There’s still five more days to go to Christmas, and quite a few events yet to come at which carols are part of the programme. This afternoon [20 December 2014], two of us went to the traditional Ecumenical Carol Service in Marlay Park. For years, this carol service has been hosted by the local Roman Catholic and Church of Ireland parishes, and for a long time it was held in the courtyard. However, the venue has been moved recently because of pressure from the Saturday traders in the courtyard, and the service has been moved to an annex behind the coffee shop and beside the walled garden. Before the service began, we enjoyed falafel wraps from the ‘Flavours of Palestine’ stall in the courtyard, and couple espressos from Bryan’s Coffee, and then strolled through the Regency Walled Garden as the evening lights were beginning to fade. In other seasons of the year, this walled garden is riot of colour with its flowers, shrubs, trees and berries. But late this afternoon, the main attraction in colour was a peacock strutting around quite fearlessly, pecking up bits of food dropped in the grass by people from the coffee shop and even confronting children in a cheeky manner, obviously begging for their children. Early Christians used the peacock as a symbol of resurrection and eternal life because of an ancient belief that the flesh of the peacock never decayed. From the early third century, the walls of the catacombs in Rome were decorated with peacocks in mosaics and paintings, representing the hope that the mortal earthly body of Christians would become glorified bodies in eternal life. When the peacock displays his pride or tail, it looks like hundreds of eyes are watching us. In this way, the peacock also became a symbol of the all-seeing eye of God and that nothing escapes God’s universal justice. 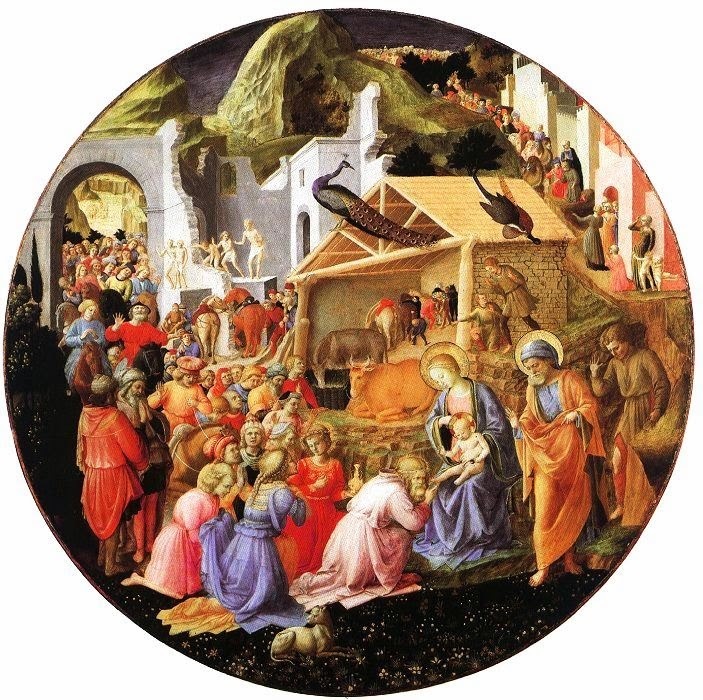 When Fra Angelico and Fra Filippo Lippi collaborated in a unique work, ‘The Adoration of the Magi,’ in Florence around 1440-1460, produced one of the first examples of a tondo, or circular painting, which in the mid-15th century became popular for domestic religious paintings. But they also included a similar engaging and curious peacock on the roof, observing the whole scene. In this one work of art, these two Florentine artists linked the Incarnation and the story of the first Christmas with the Resurrection and the story of Easter. After darkness fell this afternoon, we sang our way through the Christmas story at the carol service which was hosted this year by Marley Parish, with the support of Good Counsel Parish, Ballyboden, Divine Word Parish, Marley Grange, Saint John the Evangelist Parish, Ballinteer, and the Church of Ireland Parish in Whitechurch. The people who walked in darkness have seen a great light; those who lived in a land of deep darkness – on them light has shined. You have multiplied the nation, you have increased its joy; they rejoice before you as with joy at the harvest, as people exult when dividing plunder. For the yoke of their burden, and the bar across their shoulders, the rod of their oppressor, you have broken as on the day of Midian. For all the boots of the tramping warriors and all the garments rolled in blood shall be burned as fuel for the fire. For a child has been born for us, a son given to us; authority rests upon his shoulders; and he is named Wonderful Counsellor, Mighty God, Everlasting Father, Prince of Peace. His authority shall grow continually, and there shall be endless peace for the throne of David and his kingdom. He will establish and uphold it with justice and with righteousness from this time onward and forevermore. The zeal of the Lord of hosts will do this. (Isaiah 9: 2-7). Again, the connection was made between the first Christmas and the promise of God’s coming ever-lasting justice. Despite problems with the sound system and the winter cold, we all said the Lord’s Prayer together. I was asked the join the other clergy in the blessing before Dermot McGowan led us in singing Silent Night – as he has done for years. The people who arrived in afternoon brightness waked out of the walled garden in darkness. From tomorrow the darkness begins to recede and the days begin to get longer once again. But there are still many carols to sing before Christmas arrives with the promise of the coming of God’s justice and eternal life.